I cannot believe that Not From the Tree organizers have difficulty getting people to pick crabapples! 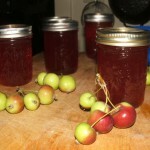 I love crabapple jelly and every time I see that there is a crabapple pick, I want to jump in. Alas, the timing this year wasn’t the best for me and it broke my heart to see crabapple pick after crabapple pick go by, with notices of “Needing More Fruit Pickers”. But finally, I was able to go to pick crabapples. And lucky me, it was only a few blocks away. I guess I shouldn’t really have been surprised the other day, when it turned out there were only two of us picking beautiful red crabapples. 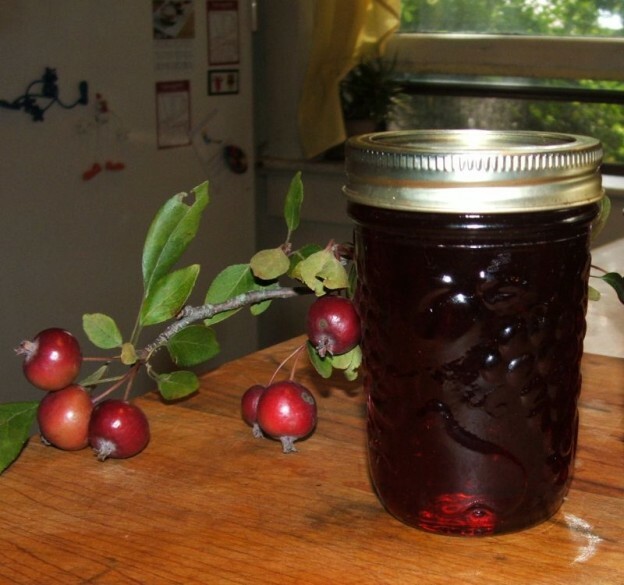 I couldn’t wait to get home to make jelly! The tree was quite tall but appeared to be in pretty good shape. And it was covered in apples! We learned from the homeowner that it had been planted in 1967 – as one of the Centennial trees. I googled to learn that Canada’s Centennial tree was the “Royalty” Crabapple, chosen because it is hardy to zone 2. We love crabapple jelly on toast. It’s also delicious with blue cheese (we splashed out and got some beautiful St.Agur at St. Lawrence Market). I cannot get over the colour of the jelly! And could it be more perfectly formed? Make jelly Do what your grandma did — preserve the surplus of apples in your back yard by simmering juiced apples and sugar. […] While it’s still hot, pour the jelly into hot jars, adding a cinnamon stick to each jar if you like; skim off any foam that rises to the top with a spoon, and seal. Set aside to cool. Process in a hot water bath or store in the fridge. Julie has also published recipe for slow roasted crabapples dinnerwithjulie.com/2010/09/08/slow-roasted-crabapples-pickled-chutney/ on her blog, Dinner with Julie. 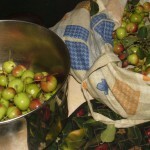 » Fried apples – thank you Barbara! » Mostly-Wordless Not-Wednesday: More Cherries! » Wordless Not-Wednesday: Cherries! …sweeeeeet! This entry was posted in food & drink, NFFtT on Tuesday, 29 September 2015 by ejm.